In 2011, an embroidery business was started at the orphan project. Embroidery floss and some material were brought from the US to teach the women some embroidery stitches. The women were excited about beginning this business. They chose someone to keep track of the supplies and the records. They embroider traditional Malawian patterns, plants, animals and scenes from their daily lives. The first pieces of embroidery that they made were sent to the U.S. to be made into purses, decorative pillows, and other home décor items. 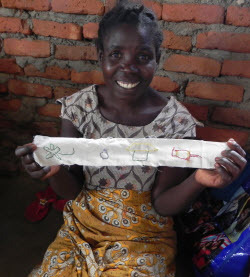 Eventually, the women might be making these items themselves and sending the completed items to the U.S. to be sold. The women have worked hard to hone their embroidery skills since they know that they will receive payment for their work when their work is sold. The donations for these embroidered items will be used to pay the woman that made the item, purchase new supplies and benefit the general fund for KOCM. 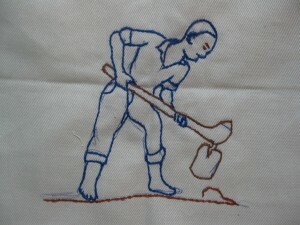 Embroidery floss is difficult to obtain in Malawi. If you have some that you can donate please write us a note on our contact page or email us at: info@malawiorphancareproject.org.